As described in a prior post (found here), a large group of Massachusetts veterans traveled to the Fredericksburg area in May 1887. 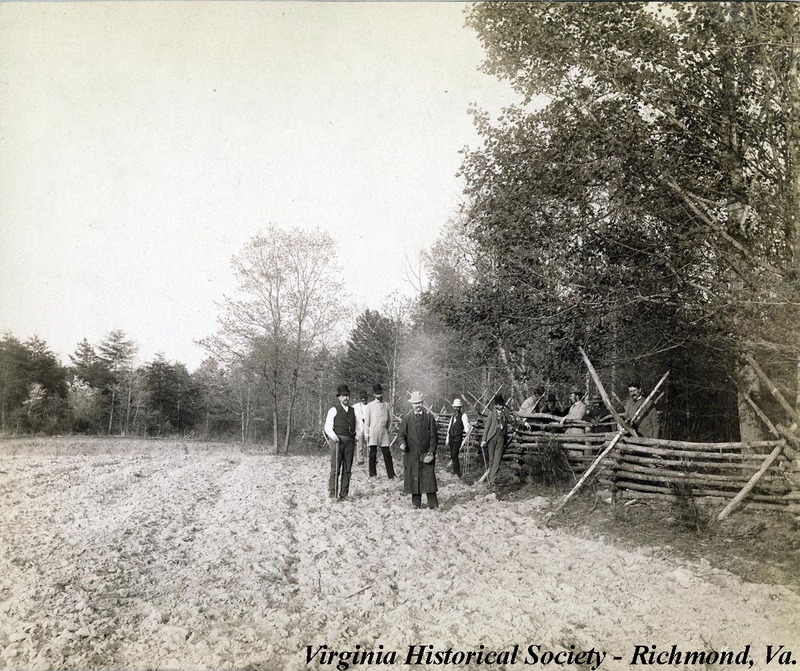 Their visit to the local battlefields wrapped up a weeklong trip to Virginia that started in Norfolk, took them to Petersburg and Richmond, before arriving in Fredericksburg. Among the party were two photographers. William H. Tipton, the famed photographer of the battlefield at Gettysburg is highlighted in the prior post. The second photographer chronicling the veterans’ excursion was Frederick H. Foss of Dover, New Hampshire. A veteran of the war, Foss joined the 56th Massachusetts Infantry in March 1864, accepting a $325 bounty. He suffered a gunshot wound, which resulted in the loss of an index finger, at Bethesda Church on May 31, 1864. After the war, Foss lived in Dover, New Hampshire and made his living as a photographer. The list of attendees for the May 1887 visit to the Fredericksburg area does list Foss as being present. Both Tipton and Foss marketed for sale the images they made on this trip. The two men used their lenses to record similar, but different, things, however. Tipton appears to have been more interested in landscape images of the battlefields that might appeal to a broad audience. Foss, on the other hand, took numerous photos of excursion members, thus chronicling the visit and marketing his photos as souvenirs of the trip. 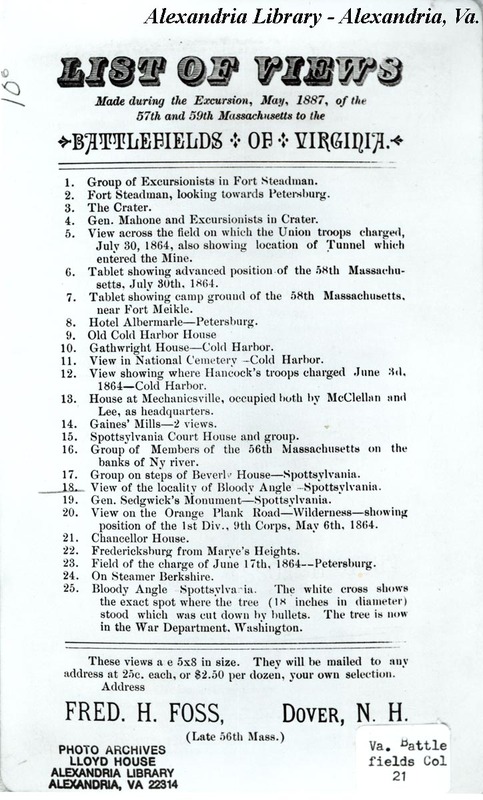 Foss’s “List of Views” from that trip shows that he offered copies of 25 photos from the visit, including scenes from Petersburg, Richmond area battlefields, and the Fredericksburg area battlefields. Students, historians, and collectors of Civil War battlefield photography are quite familiar with the name William H. Tipton. He was one of the most prolific postwar photographers in Gettysburg, Penn. and his landscape images are quite sought after, as they are wonderful documents in helping understand the sites of that battlefield. 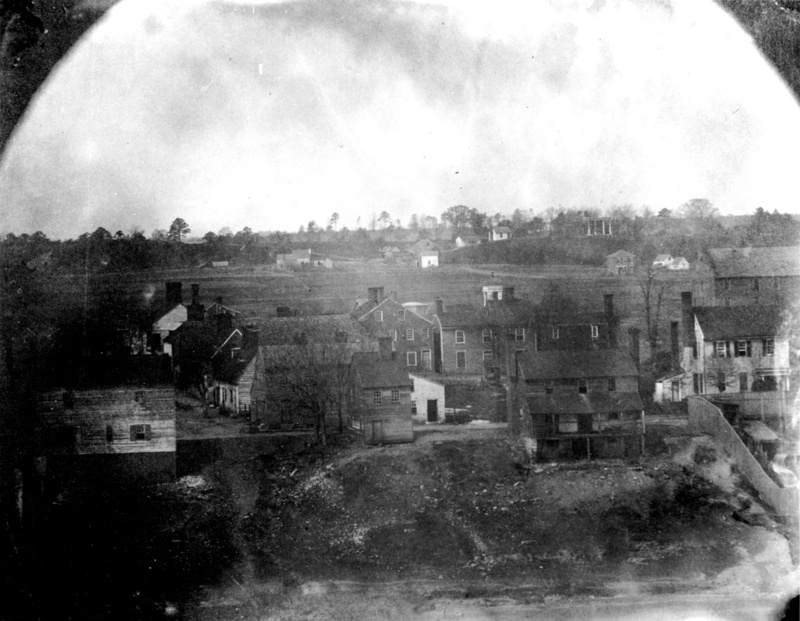 Little known, however, is the fact that he lugged his camera to historic sites outside of South Central Penn., including an 1887 visit to the battlefields around Fredericksburg. 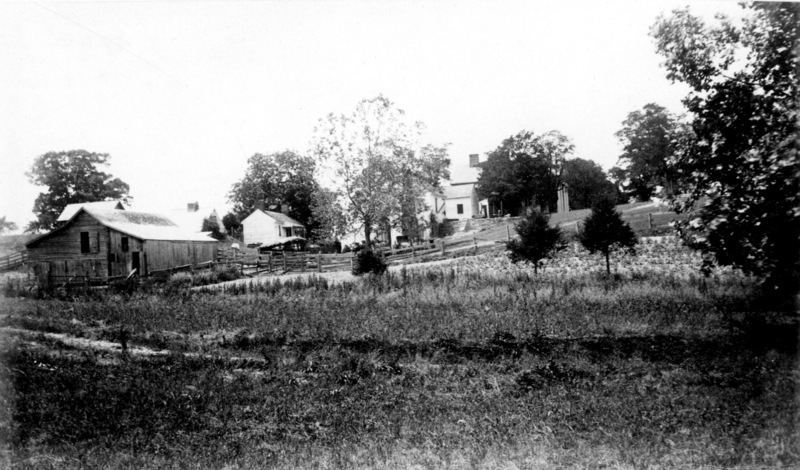 On May 5, 1887, a train from Richmond arrived at the Fredericksburg station. Among its passengers were approximately one hundred Union veterans on an excursion to visit Virginia’s battlefields. Most of these men were veterans of the 57th and 59th Massachusetts regiments and they had, prior to their arrival in Fredericksburg, visited the battlefields around Petersburg and Richmond. Their trip brought them to the Fredericksburg area for the same purpose. They spent two days touring the local battlefields and revisiting sites that many of them had not seen since the war. The Fredericksburg Free Lance covered their visit, describing the places they went and even listing the members of the party. Included in that list was “W.H. Tipton, photographer from Gettysburg.” Fortunately for us 125 years later, Tipton wasn’t merely sightseeing, but was capturing on glass those sites that he saw. 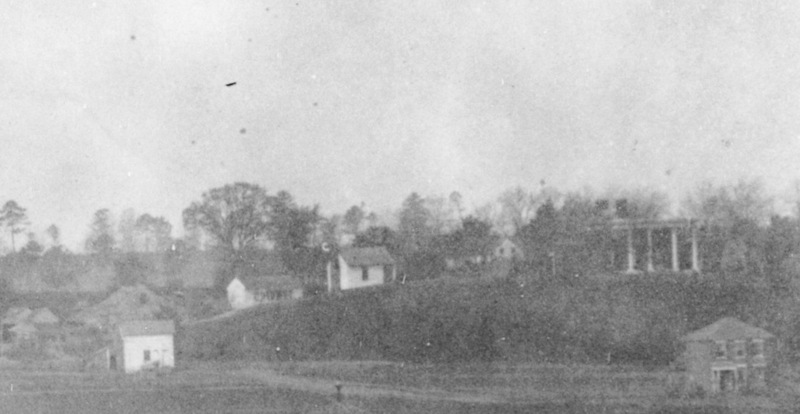 "Bloody Angle Spottsylvania May 5th 1887. Near the stump of tree shot down by bullets; the but of the tree, 15 inches in diameter is in the National Museum in Washington." Typed label pasted on photo mount. We have written about our use of new art in our exhibits here and here, and we have discussed at some length the nature of the fairgrounds and the bloody plain in front of the Sunken Road…and so I wanted to share with you the latest piece of art we have collaborated to create–an image of one of the earlier Union attacks in front of the Sunken Road, painted from an aerial viewpoint almost directly in front of Brompton. Directed by Frank O’Reilly and created by Mark Churms, this piece will be used in a wayside exhibit located just east of the Innis House. It will also be incorporated into our re-do of interior exhibits at the Fredericksburg Visitor Center, a project now in design. At some point artist Mark Churms will be making this image available for sale as a print. We’ll let you know when that happens. In our last (click here), we explored the background of a couple of A.J. Russell images, getting a new look at the Bloody Plain in front of the Sunken Road. The second of those images, above, also offers an unparalelled look along the top of Marye’s Heights, specifically at Brompton and the outbuildings that surround it. Brompton is a place of visual and historical prominence, and yet much of its story remains obscure. Its wartime owner, John L. Marye (rhymes with Marie), acquired newly built Brompton about 1823 and would, on the eve of Civil War, represent Fredericksburgers and Spotsylvanians at the 1861 secession convention in Richmond. He was a man of calm manner and centrist politics, disinclined toward confrontation–either individually or on behalf of the constituents he represented. He was, by his own admission, a “slow coach” when it came to secession. Yet beyond this and a few scattered details, we know little of Marye and his life before the war (though we know a great deal about his son, John Jr., who was lieutenant governor of Virginia in the 1870s and a prominent local attorney–the two men are routinely confused with each other). We don’t even have a picture of him. We do know this: his majestic home projected power and wealth, a stark contrast to his neighbors just yards away on the Sunken Road (a heterogeneous lot of families you can read about here). He is, though, synonymous with the Battle of Fredericksburg, for it was John L. Marye Sr. who gave his name to Marye’s Heights, the commanding Confederate ground that dominated the plain below. This image offers by far the best sense of how dominant Brompton was, and it offers a terrific view of the landscape beyond the big house. How ironic is it that the most important battlefield landscape in Virginia that’s been virtually lost is also the one that’s the best documented photographically? I suppose there’s some consolation in that. These images are nearly 150 years old, but they’ve rarely been seen or published. At first glance they look to be fairly common images of Fredericksburg during the Civil War, offering little that hasn’t been noted before. But a closer look into the background in fact reveals an entirely new perspective on the fields beyond town–the Bloody Plain. 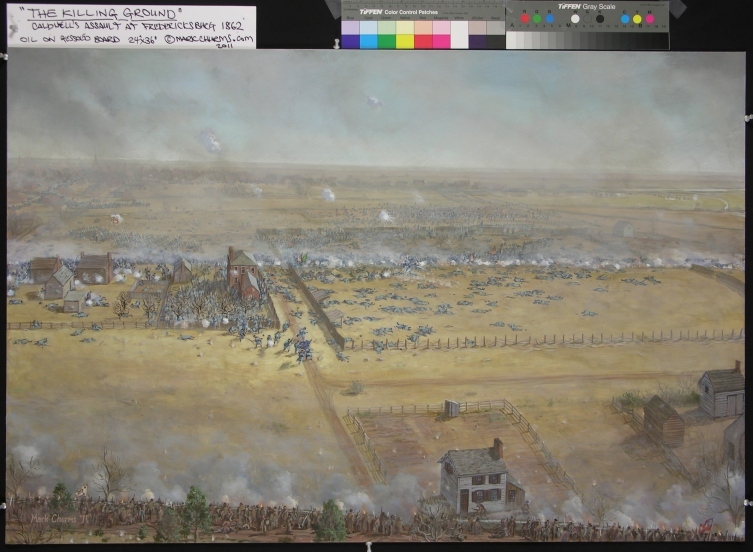 These images, together with the Federal Hill panorama surely make Fredericksburg’s Bloody Plain the best photographically documented battlefield landscape anywhere (at least in terms of wartime images). There are three images, two of which we share here today. Both by A.J. Russell; both 1863. 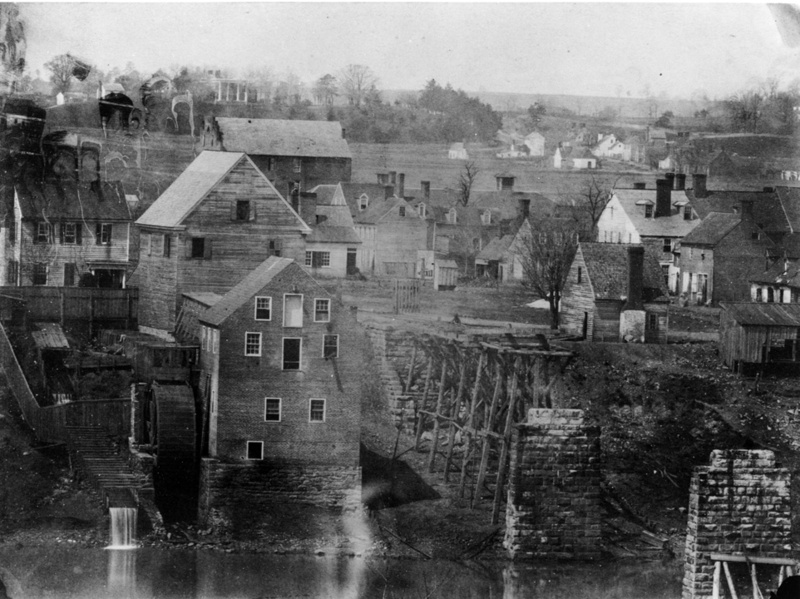 The first shows a familiar foreground–John Marye’s Excelsior Mill, just below the ruined railroad bridge, and beyond it Alexander and Gibbs’s Tobacco Factory, where the slave John Washington worked in 1860. Original at the Wes. Res. Hist. Soc. The second image takes in ground a bit farther downstream and focuses on an industrial part of town that is today largely consumed with parking lots associated with the train station. Original at the West. Res. Hist. Soc. In July 1963, Fredericksburg native and former Detroit Tiger turned developer Russell Sullivan (you can see Sullivan’s Major League stats here) acquired a small parcel of land along the Sunken Road just below historic Brompton and started planning a new apartment complex. One 72-foot long, 4-unit apartment was to face south, along Mercer Street; another of eight units was to face Brompton itself. The National Park Service reacted with alarm, but due to “technical difficulties which we couldn’t overcome” (probably issues with the deed or a lack of money), Superintendent O.F. Northington was unable to acquire and protect the property. 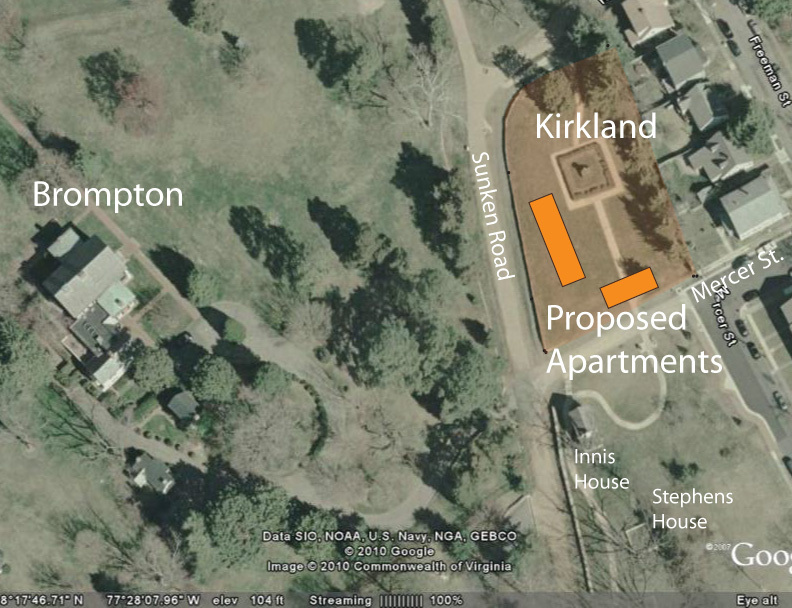 In early 1964, the bulldozers started to move, preparing the site for the apartments–just 25 feet from the original section of stone wall on the Sunken Road. Newspaper photos from the Free Lance-Star show piles of earth and heavy equipment in action. The site was a mess. An image from the Free Lance-Star showing work underway. That's the original section of the stone wall.